Burns, blisters, boils and a good dose of hypochondria: A day in the life of an ED clinic in a camper van in a refugee camp. Written by Gilly Spencer, Humanitas Volunteer. I’m now sitting in the camper with a mug of Yorkshire tea and thinking about yesterday, the highs and the lows and the possibility that the lows actually became the highs, the great Doctor and I did good. It was a slow start to the day, we had jobs to attend to and it was early afternoon when we arrived at Idomeni camp. We donned our backpacks and headed off into the camp so see if anyone needed us. There is medical presence in and around the camps, however Ramiz and I seem to be the only ones actually getting down among the people there, seeking out people who need us. We treated nappy rash, gave out Vaseline for chapped and cracked lips (anyone who says lip balm isn’t a life saving medicine, you come see me!! ), nappies for tiny babies, pain killers for headaches and back pain and saw a great number of people with conjunctivitis. We offered education about hygiene: easy to say but difficult to execute with limited water and washing facilities in an overcrowded refugee camp. Ramiz told me I had started to develop emotional desensitisation as my brain has stopped telling my eyes to be horrified at everything that they are seeing. I have to keep reminding my brain and my eyes that living in a tent on a railway track with no electricity, no water, no food and lastly no hope is not normal or acceptable despite the people here waving and smiling at us, inviting us into their “homes” with warmth and kindness. If only the rest of the world could offer such compassion that we are encountering as we pass tent after tent after tent. We stopped to chat to Mohammad, he used to live in Allepo, Syria, maybe you have seen it on the news in recent weeks, if you have you’ll understand why Mohammad is no longer there. He didn’t have any medical need but it was clear we could still offer him something. We listened whilst he talked and told us his story. We showed him we cared, that we understood what he was telling us, I wiped away a tear as he told us he might have been better off dying in Syria than existing in Idomeni. The hardest thing is when people are telling you about the injustice of the situation, all I can do is nod and say “I know”. It’s hard. After Idomeni we travelled the short distance to a makeshift camp at Hotel Hara. I’m informed that Hara in Arabic means crap and I didn’t fail to see the irony here. We had been told that another NGO were managing things here on a medical basis. If this is true, they need to get back to medical/nursing school quick smart. The wheels of the van had barely stopped turning and we hadn’t even opened the doors when a man ran to us shouting “doctor doctor”. His daughter, 3 had stuck what looked like a tent pole into the roof of her mouth causing a pretty decent wound. And so it began and it didn’t stop for 4 and a half hours when we finally had to close the van doors and say we would be back the next day. I was on fire, I’m an ED nurse, this is how I operate: quick, efficiently (well I think I do!!) with care, compassion, bubbles and balloons! Ramiz and I quickly worked out a system of seeing, treating and dispatching people so we could make the most of our time. We saw: sore throat, burns boils and blisters. Abdominal pain, headaches, exhaustion, penetrating soft palate wounds, lots and lots of dental problems, diarrhoea and vomiting, kids with fevers, conjunctivitis, tonsillitis, allergies, coughs and colds and the essential ED attendance, a good old dose of hypochondria. Although in the circumstances I let it go this time! We dispensed medicines, I dressed wounds and shed the odd tear, what can I say I’m soft under this hard ginger exterior. There was a moment when I think both Ramiz and I held our breath when a couple came in the van, the lady was 6 months pregnant and hadn’t felt baby move for 2 weeks. The breath holding came as Ramiz ran the foetal heart USS over her abdomen, we exhaled as we all heard a healthy heartbeat come back at us. 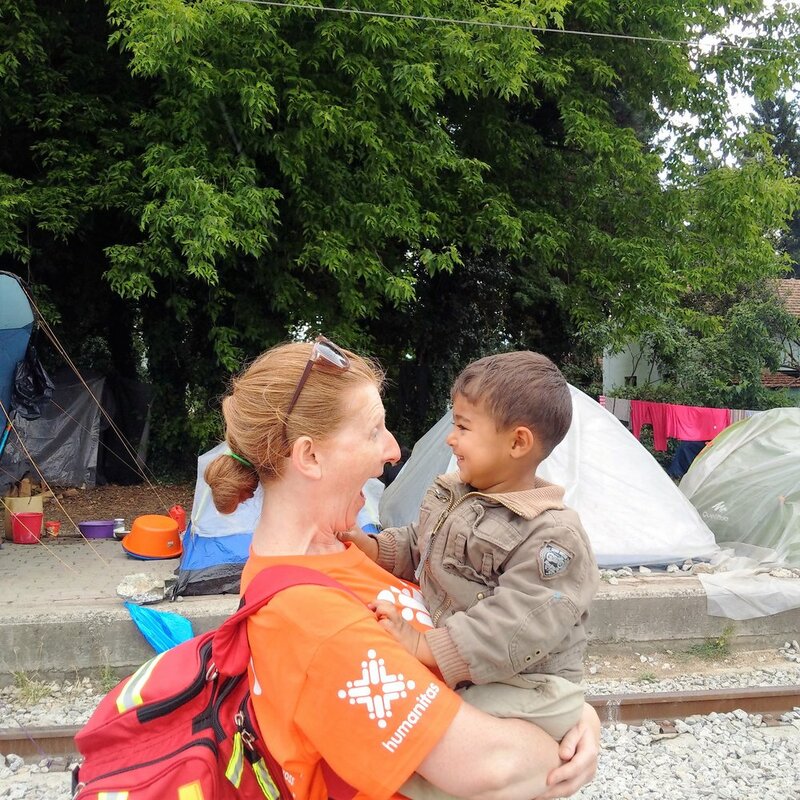 Heartwarming and heartbreaking in equal measures, what life is that child going to have in a refuge camp? Let’s hope situations change soon. We didn’t stop in all the time we were at Hotel Hara and left with a high five and a good dose of self praise, we really felt that we had accomplished what we had set out to do, see and treat those in real need. We might be small in number but we worked like 10 yesterday, the great doctor and the ginger nurse did good. It took a good few hours and a large number of mugs of tea before I finally felt ready to hit the sack, after a steady start to the day I did really feel we had accomplished a lot, we offered both physical and emotional care to people from Syria, Pakistan and Afghanistan in a camper van, in a refugee camp in Greece. What we got back in return is priceless. Gratitude, warmth, kindness, smiles, handshakes and hugs. We came, we saw and we will return today. Humanity is alive and well in Hara today. I’m proud to be part of Humanitas, indeed one half of this operation this week. Yorkshire tea: solves everything right?